The San Francisco Bay Area is so expensive that Dave Asprey, founder and CEO of Bulletproof, moved to Canada and commutes by private plane. Asprey said it’s more affordable to charter a private plan for his commute – which costs about $US600 round-trip – than it is to live in Silicon Valley. Commuting from Canada has given Asprey the lifestyle he’s always wanted. On a 32-acre organic farm on Vancouver Island, off Canada’s Pacific Coast, entrepreneur and biohacking guru Dave Asprey runs a $US100 million startup. He drops his kids off at school most days, picks food from his gardens, and works from a home office bigger than most studio apartments. It’s the lifestyle he always wanted but could never afford while living in the San Francisco Bay Area. About eight years ago, Asprey, 44, left California because of the out-of-control housing costs, and moved to Canada. 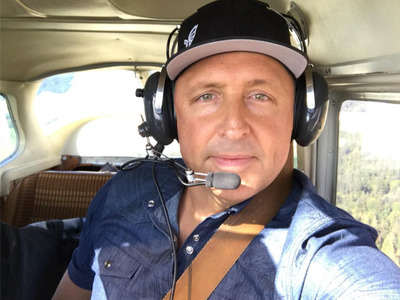 While he works works remotely most of the time, the founder and CEO of wellness brand Bulletproof also charters a private plane for the occasional commute to Seattle, where his company is located. He says that his commute may actually be more affordable than renting in the Bay Area. “If I have a ‘living’ budget that will support me in the Bay Area, I have the ability to live somewhere affordable with a super-amazing environment around me and good people, and commute wherever I want,” Asprey told Business Insider. When Asprey needs to go to Bulletproof’s headquarters in Seattle, he arranges for a town car to bring him to and from a small airport that’s located 12 minutes from his house. He charters a single-engine plane – often a Cessna 206 – that flies him to Seattle in 40 minutes. The round trip costs about $US600, including the town car, according to Asprey. When Asprey lived in Silicon Valley, he said his quarter-million-dollar salary made him feel less than middle-class. A critical lack of housing has caused home prices to soar. The median-priced home in San Francisco costs $US1.5 million, and a person needs an annual household income of at least $US303,000 to afford the 20% down payment on a home that expensive. Asprey said he doesn’t fly private to San Francisco, because the plane he charters can’t fly that distance. Still, he said he travelled to conferences, meetings, and the office 170 days out of 2017 and decided that commuting from Canada was still more cost-effective than living in the Bay Area. Asprey prefers town cars to Ubers because he doesn’t like waiting to be picked up. He said he thinks it’s important to “invest in making your commute tolerable” if you’re going to give up proximity to the office, and fortunately for him, those rides are tax-deductible business expenses.